Old, TV-sized CRT monitors use entirely different technologies to display text and images on the screen than do LCD monitors. Achieving the optimal view settings for your LCD screen includes paying close attention to the specifications of the LCD’s display. If you want to get sharp text and images displayed on your LCD monitor, you need to run the monitor at its native resolution. Running the display at a resolution lower than the native one usually results in blurry text, images, and video. This is especially true for High definition or HD 1080 LCD displays. What is an LCD’s Native Resolution? LCD monitors have a native resolution that coincides with the pixel layout of the display. Essentially, designers of the monitor had a specific resolution in mind when creating the monitor’s screen. This is one of the limitations of LCD monitors. Notice that the first one is the standard monitor aspect ratio while the remaining two are widescreen. Once a designer has decided on the aspect ratio of the monitor, the second factor to consider is the actual size of the screen. LCD monitor sizes are measured diagonally and typically come in sizes ranging from 17 inches up to 30 inches. 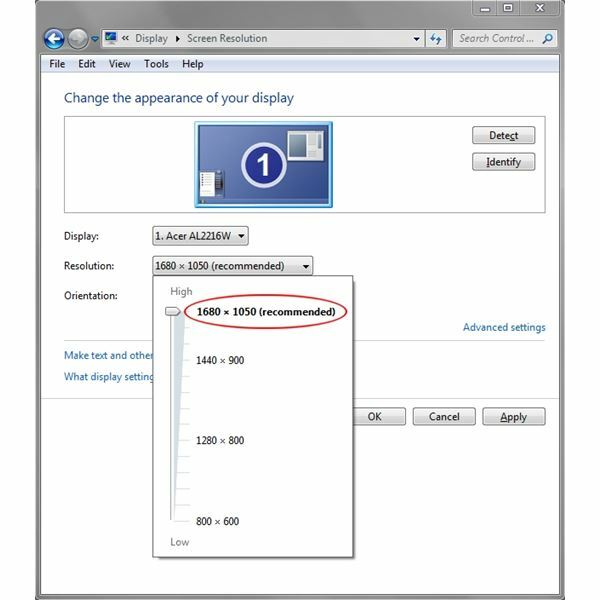 Setting up the optimal setting for your LCD monitor means choosing to run its display at the native resolution. Normally, you cannot set an LCD screen’s resolution higher than the native resolution so the native resolution is usually the highest setting available to you in Windows. If you are running Windows 7, right click anywhere on your desktop and choose Personalize from the menu. At the bottom left of the screen, click on Display and then click on Adjust Resolution. Click the arrow next to the drop down menu labeled Resolution and notice that you can change the resolution of your monitor using the slider. In the image below, you can see that this particular monitor can be set to a resolution ranging from 800×600 to 1680×1050. You can also see that the highest possible resolution is also the one recommended by Windows 7. This is because 1680×1050 is the native resolution and the one that will produce the sharpest images and the crispest text for the user. If you want to view sharp images and crisp text on your LCD monitor, you should run the screen at its native resolution. The native resolution is the optimal setting for an LCD monitor because it is the resolution for which the designers created the screen. Running a display at a lower resolution often results in blurry text and images. Be sure to get the most out of your High Definition HD 1080 LCD monitor by running the best view setting.